All proceeds from the sale of these t-shirts go to funding the 100 Thousand Poets for Change Tibet Awareness Event in Pasadena, CA on September 29, 2012. All t-shirts are made ethically in the U.S.A. and with a commitment to our earth - sweatshop free and organic. 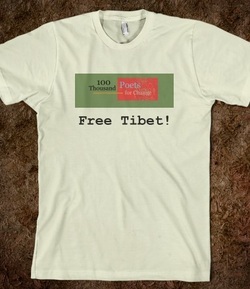 100 Thousand Poets for Change Free Tibet is a volunteer driven project. Any donations will go towards funding the event and will be much appreciated. Donate $5, $10, $20 or your chosen amount. Thank you for your support.